The Cedar Valley Irish Cultural Association, founder of the Iowa Irish Fest, is an organization intended to foster and develop Irish fellowship and outreach into the community with Irish cultural events and programs. Entering its 13th year, the Iowa Irish Fest is an open-air event held on the first weekend of August in Waterloo, Iowa. The Fest provides nearly 50,000 annual attendees the opportunity to participate in a premier cultural event that broadens their global perspective and introduces them to experiences and lifestyles far beyond the Midwest, while acknowledging and celebrating the history of the Irish community. Association President, Jim Walsh, said, “The Irish in Iowa have done such a fine job of melding into their communities that we felt it was time to draw them back out a bit and show them off to their neighbors and as many visitors as we could. 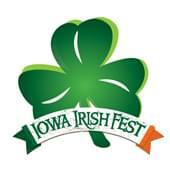 Iowa Irish Fest, August 2nd-4th in downtown Waterloo!